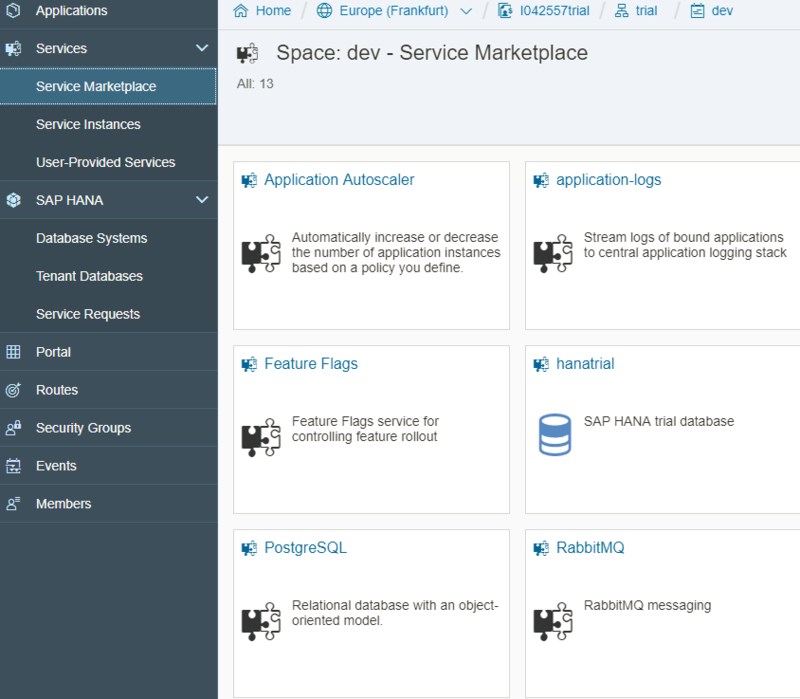 This blog post presents how to integrate tenant-aware persistency in your application based on S/4HANA Cloud SDK running in SAP Cloud Platform, Cloud Foundry. Note: This post is part of a series. For a complete overview visit the SAP S/4HANA Cloud SDK Overview. In case you have questions or suggestions, reach out to us in Stackoverflow via s4sdk tag. Our development team is actively monitoring this tag and is making sure that the questions and requests are addressed properly. You can use this opportunity to share the experience and to get an advice from a broader Stackoverflow community. Of course, we are happy to receive your questions and suggestions in the comments to our blog posts, as well. When you build a side-by-side extension for SAP S/4HANA in SAP Cloud Platform, you can integrate various backing services of SAP Cloud Platform in the application logic. For example, you can enrich the data retrieved from the backend S/4HANA system with an additional data model. Let’s say, you are retrieving the cost center data, its planned and actual costs from SAP S/4HANA. In the application logic in SAP Cloud Platform, you calculate the cost forecast for the next year and store these additional key figures in a persistence service in the cloud platform. When building a multitenant SaaS application, consumed by several customers, you have to ensure the data isolation by implementing tenant-aware handling of data. Imagine, you have customer A and customer B. Both of them subscribe to and use one running instance of your application, but they would like to store and access their data independently. Each of them want to be sure that his data is secure and not accessible by any other customer. Each of the approaches has its advantages and disadvantages and each of them is more suitable for some use cases. In this blog post, we take a look at an example application that implements a schema isolation approach. Security aspects related to authentication and authorization are only partially covered in this blog post. Please check out the corresponding blog posts in our series to get more details on this topic. Managing of the database migrations and database refactoring for multiple tenants. Before you continue with a hands on part of this tutorial, make sure that you have installed the development tools, as described in the blog post Step 1 with SAP S/4HANA Cloud SDK: Set up. In this tutorial, we will work with SAP Cloud Platform, Cloud Foundry. To be able to deploy your application in SAP Cloud Platform, you need to set up your account and Cloud Foundry tools. To do so, please, refer to the section “Setup for CloudFoundry” in the tutorial Step 3 with SAP S/4HANA Cloud SDK: HelloWorld on SCP CloudFoundry. The application described in this blog post is developed using the Spring Boot framework. I do not cover all the principles of programming with Spring Boot framework in this blog post and I assume that you are already familiar with some basics. If you are interested to learn the details about Spring Boot in general, this guide can be a good starting point. To focus on the presented topic, I leave out the deep dive into the JPA (Java Persistence API) / Hibernate concept. There are a lot of online resources that make a good introduction into this topic, such as Java Persistence API, Hibernate Documentation, Hibernate Getting Started Guide, just to name a few. Having said that, let us get started with integrating a persistency into an example application based on the S/4HANA Cloud SDK. As a result of the steps, described in this part of the tutorial, you will have developed an application supporting a tenant-aware persistency. 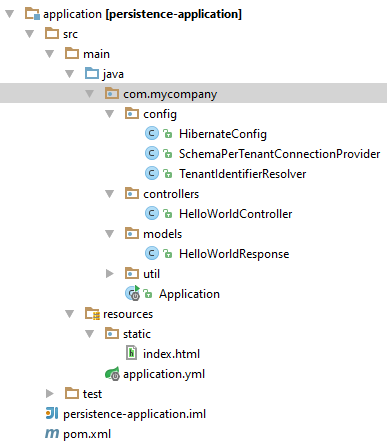 In this example, I use Spring Boot framework with Hibernate as JPA layer. The application is developed for SAP Cloud Platform, Cloud Foundry and I use PostgreSQL as a persistence service. You can also check out the full source code example from our GitHub repository. As usual, we get started with the development of the SDK based project by generating a project structure using one of the predefined maven archetypes. For the development of a Spring based project, use archetype scp-cf-spring, as shown in the maven command below. If you worked through some of our previous tutorials, the generated project structure might be familiar to you. Please, refer to the blog post Step 3 with SAP S/4HANA Cloud SDK: HelloWorld on SCP CloudFoundry for the detailed explanation of this project structure and the reasoning behind this. Below, we investigate the application folder in more details, as its artifacts are specific for Spring framework and differ from the ones described in the previous blog posts. src/main/java You will add your application logic here. 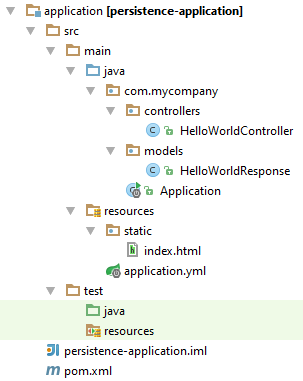 The folder already contains the classes that implement a simple Spring Boot “Hello World” application, such as Application.java, HelloWorldController.java, HelloWorldResponse.java. src/main/resources Here, we add resources required in the application logic, such as configuration files. 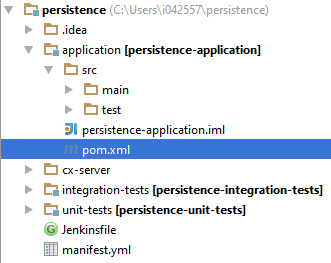 application.yml file is already added here and we will extend it in the later steps for setting up the persistency. src/test/resources Additional resources for attached test modules. pom.xml This is your project management file for Maven where you can maintain other sdk and open source dependencies or use plugins that ease your build environment. In order to be able to use additional tools required in this tutorial, you need to extend project dependencies in your application pom.xml file. Now, when the project structure is generated, we can get start extending our simple “Hello World” application. As promised, we will add a capability to persist the data in a database considering multitenant environment. First of all, we need to adapt the default configuration of Hibernate to make it tenant-aware. Luckily, when using Spring Boot framework, it can be done with just a few lines of code. Let us take a look at this source code in details. With Spring Boot, you can configure your persistency programmatically without creating of a persistence.xml configuration file. In method jpaVendorAdapter, we specify that Hibernate implementation of JPA will be used in this application. 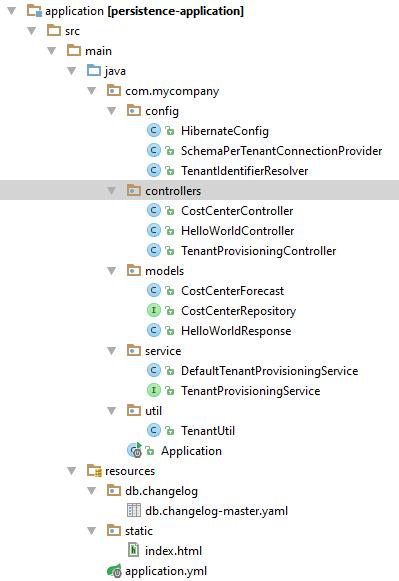 In method entityManagerFactory, we can set up additional properties for a used entity manager. For the entity manager factory, we set up a data source, packages to scan to find a related data model in the application, and the JPA vendor adapter. Firstly, we specify that multitenancy is implemented as separate schemas. Secondly, we specify that the object multitenantConnectionProvider will handle creation of connections to your data source. We still need to provide our own implementation of the interface MultiTenantConnectionProvider and we will take a look a this below. Thirdly, we provide a tenantIdentifierResolver that will take care of retrieving of a tenant id at runtime. For that, we will implement the interface CurrentTenantIdentifierResolver. getConnection This method returns a connection set up for a database schema name dependently on a tenant id. TenantUtil is an additional util class that we will implement in order to apply a schema name derivation from the given tenant id. releaseConnection For the given connection, this method changes the schema in the connection to the default schema (we configure the default schema name in application.yml that will be discussed later) and closes the connection. In the productive application, you would probably want to apply a different and more meaningful rule for your schema names. 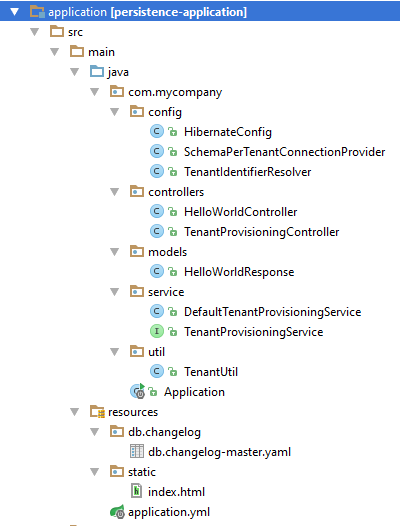 For this simple example, we will just add a prefix “tenant_” before tenant id to build a corresponding schema name. Here, the SAP S/4HANA Cloud SDK tools come into play. 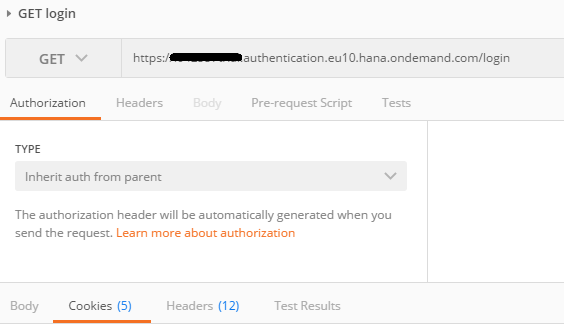 To retrieve the id of the current tenant, all we need to do is to call the method TenantAccessor.getCurrentTenant().getTenantId() that is coming with cloud platform module of SAP S/4HANA Cloud SDK. For the Cloud Foundry edition of SAP Cloud Platform, this method retrieves the tenant id from a corresponding JSON web token. See more details on this topic in the following deep dive blog post. Other required parameters that can be configured in this file will be discussed later. 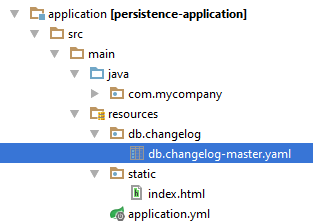 After the Hibernate configuration is done, we can move forward with the first services supported by the application. When you develop a multitenant application for SAP Cloud Platform, Cloud Foundry, you will need to create a service for tenant onboarding and offboarding that will be called by SAP Cloud Platfrom each time, when an account subscribes your application. While publishing your multitenant application, you will need to register your application callback URL that will be called when a consumer tenant subscribes/unsubscribes to an application; callback URL has to comply to following convention: <some-url-path>/<tenantId> and must implement PUT (=subscribe) and DELETE (=unsubscribe). When we implement schema separated multitemancy, this service needs to take care of creation and cleaning up database schemas for corresponding tenants. Let us provide a simple implementation of such services in our project. As required by SAP Cloud Platform, Cloud Foundry, this class implements PUT and DELETE methods for subscribing and unsubscribing of a given tenant. The source code does not compile yet, as we need to provide the implementation of a corresponding TenantProvisioningService. For that purpose, we will create a simple interface TenantProvisioningService and its default implementation in the class DefaultTenantProvisioningService, as shown in the code below. We put these new artifacts in a new package service in our project. For each new tenant, a database schema is created. The name a this schema is defined using the TenantUtil class that was described above. In our case, we simply add a prefix “tenant_” before the tenant id to build a schema name. Tenant id validation: to avoid SQL injections, we are checking the validity of a given tenant id using pattern matching. In this application, we check that the tenant id contains only letters, numbers, or a dash. The unsubscribeTenant method deletes the schema that corresponds to the given tenant id. As in case of subscribeTenant, we validate the tenant id against the pattern before executing SQL queries to mitigate SQL injections. Now, when the tenant onboarding service and the controller are there, we can develop other data services. Will want to have a simple endpoint that is able to handle HTTP POST and GET requests to create read cost center forecast sums. Let us start with the definition of a data model. CostCenterForecast is the Entity class we will work with. The entity will contain two fields: name of a cost center and a forecast of costs for the next year. @Entity annotation specifies that this class represents JPA entity. @Table annotation specifies the table name that corresponds to this entity in the database. @Id for the field name defines this field as a primary key in a corresponding database table. @Column annotations allow to adapt the name of the corresponding field in the database table. Other annotations in this class are related to the project Lombok that was also already discussed in our previous blog posts. As you can see in the source code of the controller, Spring Boot and Hibernate provide a very simple way to access the basic methods, such as retrieval of entities and to storing of new ones, which we require for this example service. With that structure, we are done with the development. Now, we can move on to the customizing and testing of these developed services. Let us take a look at the required customizing for the case, when we want to evaluate our application in the local environment. If you want to deploy this application locally or would like to develop and run integration test, you need to decide, what database you would like to work with. You would need to do some additional customizing in your application to be able to run against your chosen database. I will show these customizing at the example of PostgreSQL. That’s it. Now, we can add some integration tests that will automatically run against this configured PostgreSQL instance. Let us now provide integration tests for the developed services to make sure that the application is working as expected even before deploying it in SAP Cloud Platform. This tests will also be later used if we work with CI/CD pipeline. In the integration-tests folder there is already a class HelloWorldServiceTest that was generated from the SDK archetype. As we have added some service dependencies to our controllers (see the source code of the class TenantProvisioningController, for example), we have to slightly adapt the source code of the pre-generated test class HelloWorldServiceTest to make it start successfully. The simplest way would be to change the Spring Boot tests annotations so that the whole application context is loaded at the startup. testHttpGet Validates GET method on the cost center endpoint: This method first onboards a tenant and then verifies that HTTP GET method on the cost center endpoint returns success. After that, the corresponding tenant offboarded. testHttpPost Validates POST method on the cost center endpoint: This method first onboards a tenant and then verifies that HTTP POST method on the cost center endpoint returns success. After that, the corresponding tenant offboarded. testWithTwoTenants Validates tenant isolation: This method onboards two tenants and creates tenant-isolated data, then it read the data for each tenant ensuring the isolation, and finally, it offboards the tenants. 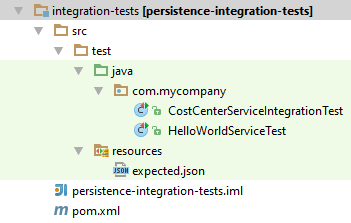 The integration test is ready and you can execute it in your favorite IDE or just run the maven command as shown below to build your project and execute integration tests. 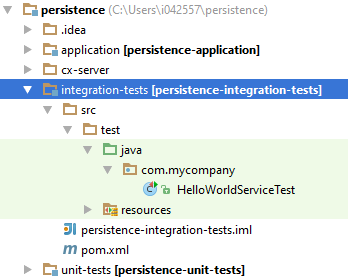 In the previous step, we did the configuration of the local persistency for integration tests (see Section 4 Configuration of the local persistency of this tutorial). When we deploy our application in SAP Cloud Platform, Cloud Foundry, we want to use the corresponding PostgreSQL backing service for the persistency and we want to ignore the configuration of the local persistency. To follow the 12 factors app methodology, we need to have the same codebase for the local testing and for the cloud platform deployments. How to achieve this without adapting of the corresponding data source configuration? Cloud Foundry platform supports a simple configuration of Spring based application to connect backing services, such as PostgreSQL. Step 1. Create a service instance. You can do this step using the command line tool of Cloud Foundry, alternatively, you can create your instance using Cloud Foundry Cockpit, as shown below. Go through “create instance” dialog by pressing “Next” until you reach the last window, where you have to enter the mandatory service instance name. Type “mydb” and press Finish. Step 2. Add the configuration class for the profile “cloud” in your application. This class will take care of scanning of all available connected services and instantiating of a data source for the found service. This simple approach will work if you have only one database service instance bound to your application. For a more detailed explanation and solution for more complex cases, please, consult the following documentation of Cloud Foundry platform. Step 3. Add service binding in your manifest.yml file and activate “cloud” profile, as shown below. After you have executed these steps, you have implemented the application that can be tested locally using the integration tests. To be able to evaluate this example in SAP Cloud Platform, Cloud Foundry, you would need to make sure that the application can retrieve corresponding tenant data. The tutorial Step 7 with SAP S/4HANA Cloud SDK: Secure your Application on SAP Cloud Platform, CloudFoundry provides a detailed How-To Guide regarding the securing of applications in SAP Cloud Platform, Cloud Foundry. There are some particularities related to the implementation of this concept for Spring Boot projects. Please, check out the Appendix, where these particularities are highlighted. In this blog post, we have discussed one of the possible approaches to building of a tenant-aware application using a persistence service in SAP Cloud Platform, Cloud Foundry with tools provided by the SAP S/4HANA Cloud SDK. 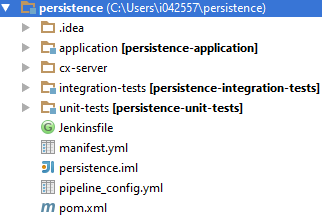 This blog post also showcases how you can test such an application locally using integration tests and local persistency. Of course, the shown application example is simplified and covers just some aspects related to the integration of a persistence service and multitenancy. Also, feel free to check out Appendix to this blog post for some additional required adaptions. For the troubleshooting with PostgreSQL service in SAP Cloud Platform, refer to the following documentation in help.sap.com. Here, you can find some useful commands for Psql. Here, I assume that you are already familiar with the concepts introduced in the blog post Step 7 with SAP S/4HANA Cloud SDK: Secure your Application on SAP Cloud Platform, CloudFoundry and I do not cover security concepts in SAP Cloud Platform, Cloud Foundry in details. The following steps need to be executed to be able to evaluate the developed application in SAP Cloud Platform, Cloud Foundry. First of all, you need to add an approuter and customize it to forward requests to your persistency application. Consult Step 7 with SAP S/4HANA Cloud SDK: Secure your Application on SAP Cloud Platform, CloudFoundry for more details on how to do that. Add the file spring-security.xml to the folder /resources/spring of your application module. In the application pom file, add all dependencies, as described in Step 7 with SAP S/4HANA Cloud SDK: Secure your Application on SAP Cloud Platform, CloudFoundry. At this point, you can deploy the approuter and your applications and evaluate it in SAP Cloud Platform, Cloud Foundry. To still be able to run tests locally, you can introduce an additional profile that will deactivate the added spring security for local testing. Now, you should be able to build the application and run tests locally, as well as evaluate multitenancy in SAP Cloud Platform, Cloud Foundry. You can now from the CSRF tocken in the header of your HTTP response (X-Csrf-Token). In this set up, use the tenant id that corresponds to the subaccount where your application is deployed. You can find the id in the cloud cockpit when you drill down to your subaccount. Add Appendix with the technical details on adapting of the application for evaluation of its multitenant capabilities in SAP Cloud Platform, Cloud Foundry. Add more references into Reading and add evaluation with Postman in SAP Cloud Platform, Cloud Foundry into Appendix. Thank you for this wonderful blog. Is it possible to use HDB instead of PostgreSQL? In the Service Marketplace (trial-account), I can only see a “hanatrial”-service. In a productive-account, is there a “real” HDB-service available? I have seen a completely different approach using the MTA-concept in order to connect to HDB. Can I combine both approaches? (New s4sdk Maven Project from “archetype Springboot” and then adding mta.yml…)? thanks for your feedback. Yes, you will have access to the Hana service in a productive account. Regarding your questions 1 and 3, we are working on a demo prototype for a multi-tenancy with HDB and recommended approaches for the implementation with the S/4HANA Cloud SDK. Stay tuned for an upcoming example project and a deep-dive blog on this topic. Thanks for the blog. Is the blog of demo prototype for a multi-tenancy with HDB available? Thank you for posting this blog and it is really useful for me. 1, Did you wrap the whole multi tenancy stuff to a maven dependency, so that I can easily import it to my spring boot application? 2, Can I use this Multi Tenant API together with VDM Generator. For example, before I call the auto generated CRUD service according to the edmx, Can I call the subscribeTenant(final String tenantId) method, in order to access the data of a specific tenant. Some simplifications of integration of multi-tenancy concepts are currently in development. Please, follow our Java release notes for the updates in the SDK versions. Can you please elaborate on the use case for this? I think, I understand why you are asking, but I would say, normally this is not required: In the multi-tenant setup, the developers (e.g. SAP partners or SAP) generate the VDM for the datamodel, which is supported by this given app, and use it in the application logic that works for all the tenants. The thing is that it would not be sufficient to generate different VDMs on the subscription of a tenant with a different S/4HANA (e.g.) custom OData services, you would also need different logic for each of those tenants. Thanks for the documents that you shared with me. If is really helpful.